One of the worst moments of a Bobcat’s semester is when he or she can’t get a ticket to the Yale game. 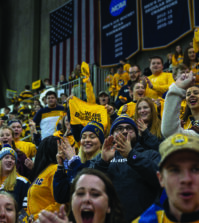 And since only 1,000 student section tickets were made available, many students felt bitter disappointment when the tickets sold out. Last Tuesday night, students huddled around their laptops as they waited for the 10 p.m. ticket release time. The student portal is often jammed by the high amount of online traffic, so some tried to improve their chances by using different WiFi networks or finding computers hardwired to the Internet. The anticipation and anxiety of those few minutes leading up to 10 p.m. was intense, and right as the clock switched from 9:59 p.m. to 10 p.m, everyone began clicking on the ticket portal link. There were rumors that student tickets sold out in 10 seconds, but the New Haven Register reported that it actually took five minutes. Regardless of that report, it certainly felt like only 10 seconds. “Sold Out! !” was listed next to the game nearly instantaneously, and that was a very frustrating sight. 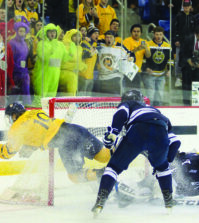 To add to the frustration, there were many Yale fans at the game. 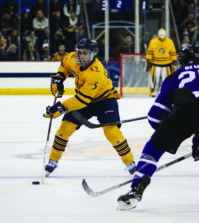 Of course, they have every right to purchase tickets as well and the university has a ticket lottery similar to Quinnipiac’s, but it would have been nice to see a little bit more gold in the arena – as if there wasn’t enough already. Hopefully some of the unlucky majority who had to watch the game on their TVs will get tickets next year. 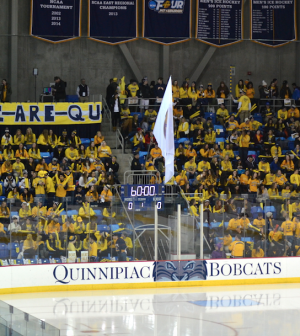 And maybe next year Quinnipiac will win.